How Does Speed Happen? Part 1 | Mediterra - Swim & Run Better Than Ever! I am continually looking for ways to make this more easily understood to swimmers. Speed, and more importantly – sustainable speed – is dependent on both technique and fitness, not one or the other. The training must not be separated from each other. And the properties of water create a situation where the swimmer is instantly penalized for neglecting to develop the two together – penalized by being slower than he should be and/or exhausted way before he should be. And they are not equals for those who pursue highest speed potential – fitness is subordinate to technique, as I will argue below and in Part 2. It may be helpful to examine this in a graphic form. Look at Swimmer Situation A. Drag = the resistance of water working against the swimmer’s forward motion. 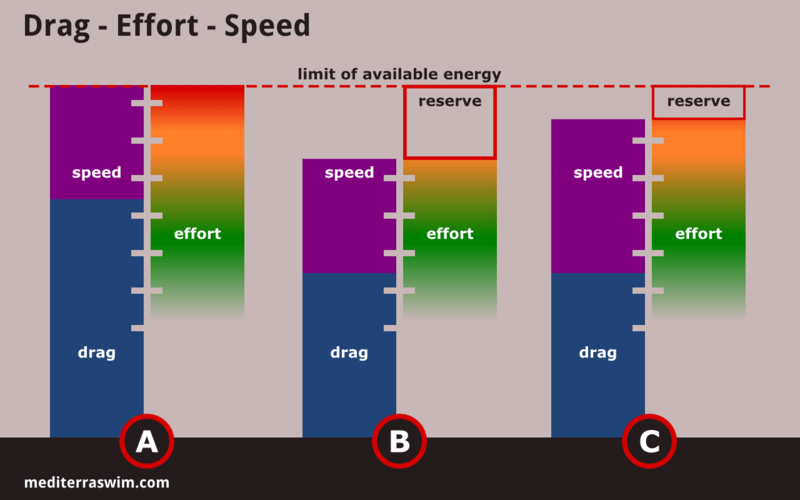 Effort = Exerting force against drag. Exerting force (intangible) requires Effort (tangible). In order to move forward the swimmer has to exert greater force than the force of the water resistance working against her. The swimmer’s zone of effort is green where it is relatively easy and turns red where it approaches maximum. Note the dashed red line at the top. There is a limit to the amount of energy the swimmer has available: Force comes from Effort comes from Energy. Speed = the difference between the amount of drag force and the amount of swimming force (effort) the swimmer puts out. Note that the speed cannot exceed the effort, and effort cannot exceed the limit of available energy. Swimmer A is applying maximum effort, reaching the limits of his available energy, and he is achieving X amount of speed. But compare that to Swimmer Situation B. Swimmer B is traveling at exactly the same speed as Swimmer A but doing so at lower effort level (the purple Speed box is the exact same length, but situated lower on the effort scale). How does Swimmer B do that? Notice the difference in the two diagrams. Swimmer B is using less effort, while achieving the same speed because she has found a way to reduce drag, she has shaped her body in such a way that there is less water resistance working against her. This also means that Swimmer B has energy in reserve available for her to use in other ways (to sustain speed longer, to increase speed at the end, or to use that energy in the next leg of the triathlon, for instance). Swimmer A has no energy in reserve. How NOT to increase speed? Swimmer A treats power training separate from technique training and is therefore essentially stuck in Situation A. As he increases effort the drag working against him increases proportionally to it and negates much of his effort. Then he reaches the limits of his power/effort and therefore reached the limit of his speed. This happens because he has not trained himself to maintain lower drag at higher effort – he habitually practices turning off his attention to technique when he turns on his attention for effort. It is one or the other in his mind and the limit to his swimming speed reveals this. His speed potential is ultimately limited by his poor technique, or poorly-imprinted technique – it is not available to him at higher intensity swimming because he never practices that way. Though #2 is acknowledged as important by everyone, typical, traditional training fills precious pool time predominantly with Approach #1. In order to gain more speed the goal is to raise the limit on available energy. It is a valid approach, and it is an expensive one in terms of time and energy, as the ‘Swim Harder = More Speed’ and ‘More Yardage = More Speed’ dogma testified to. And Approach #1 has limited promise. There is a limit to how much more available energy a swimmer can condition himself to produce, especially a mortal one (like us) who has small budget of time and energy to spend on his training each week. But Approach #2 has virtually unlimited room for improvement, and comes at a fraction of the cost of Approach #1. If Swimmer B trains first to lower drag, then has constrained herself in practice, without compromise, to maintain that low drag technique as intensity increases she finds herself in Swimmer Situation C*. As she increases effort she also increases in speed because her drag does not increase in proportion to it. Notice how Swimmer C is using less effort yet achieves more speed than Swimmer A (her purpose Speed box is longer). And she has a bit of energy to spare is reserve to use in others ways if she wants to. Which Swimmer Situation do you find yourself in? Which approach to speed would you like to spend your precious weekly budget of time and energy upon? * For simplicity sake on the diagram, I did not factor in the natural exponential increase in drag resulting simply from the increase in water pressure as speed increases. That’s bit too complicated for the purposes of this conceptual discussion. But now as TI transformed my pool work into an endless interesting part of life I’m insecure if that lets me become too leisurely to my attended cadiovasular shape. In this sense swimming 1000m now is much more effortless than I did two years ago (for me wasn’t possible then), but cardiovasular shape might have be quite better two years ago. Another question not directly belonging here: Where to plan single pool sessions after a long break, when in bad shape over all? Have no fear of swimming with a higher heart rate. Take the best stroke you have right now and challenge it in various ways. You will build fitness while you stay completely focused upon technique. You can increase the challenge upon your stroke by adjusting the metrics of your swim (which will also challenge your brain and your muscles at the exact same moment). My next blog post this week will list the ways to increase your challenge. Have you ever noticed in those African Safari documentaries that the baby cheetahs don’t spend time working on their speed – we’ve never seen them running laps on video, have we? They spend their time working on tracking, and killing skills and the fitness improvement they need is built into it. Work on your skills that create speed, increase the challenge you place on them, and speed will happen as the inevitable product of that intentional challenge. Take that weak skill, and spend some time working on it slow, then some time working on it at different stroke counts, then some time at different tempos, and then some time holding focus on it over longer distances. A mixture of rest and challenge, easy and difficult, short and long. Trust me, you will be working hard (and raising your heart rate) when you try to increase intensity or complexity and hold that same laser focus on a particular skill. Much of the skills you work on in 25 – 50 – 100 – 200 meter pieces are the same things I work on. I just happen to practice them at higher challenge levels – in open water without walls, on 300 to 2000 meter pieces, with waves, in cool water, etc. So, understand that the focus on fundamental skills is perpetual, its just that we gradually increase the challenge level. YOu may have heard how elite athletes will stress the importance of fundamentals – it is true for swimming too – the more challenging the conditions, the more intensity we apply to our swim, the most critical those fundamentals show themselves to be. Send me an example of how you plan your practices and I will suggest some ways to increase the challenge you place on yourself to get both technique and fitness work built into the same practice.